Thanks to Jovial for partnering with My Humble Kitchen. Please remember that if you order anything from Jovial’s online store you will receive 10% off PLUS free shipping by using the online code, HumbleK. I haven’t been making many braises in my kitchen lately. Humble pieces of meat, browned on both sides, then simmered in a homemade sauce, low and slow, until the meat is perfectly tender and the sauce is filled with everything good that was added to the pot. Since a braise to my liking takes at least 2 hours to cook, I’ve had to create more slow cooker meals these past two years since every recipe I develop at home is set aside for subscribers to my menu plan service. Although a slow cooker meal is often times a great alternative to a braise on the stovetop, my heart often yearns for the more traditional approach where rustic, deep flavors can be created. With the changing seasons, I decided to welcome spring with a simple braise of steak, asparagus, and carrots simmering in a reduction of red wine and crushed tomatoes and then infused with the aromatic of fresh sage. Sounds fancy that way, doesn’t it? It’s really not. It’s just real, seasonal, good food. When I start a braise at home, I start by browning my meat on both sides. To begin, I gently brought to heat a couple tablespoons of extra virgin olive oil. If you’re one that fears using olive oil in your cooking, check out my post on how to cook with extra virgin olive oil the right way. Thanks to Jovial, I’ve been using their organic olive oil harvested from their Italian farms. After gently heating the olive oil, I seasoned the meat and browned it on both sides. Once the meat had browned, I removed it from the pot and then added some diced onions with a dash of salt and sautéed them until they just turned translucent. I then added about 3 carrots, always cut on the diagonal, and sautéed them for an additional 3-5 minutes or until crisp tender. I could begin to smell their sweetness. I then added a half cup of my favorite Spanish Tempranillo red wine and reduced it until it simmered down to almost nothing. At this point I added a jar of Jovial’s organic crushed tomatoes. These tomatoes are sweet and completely nourishing. I continued to cook the sauce down for an additional 10 minutes so that the tomatoes could begin to fry and meld with the rest of the ingredients. I then submerged most of the meat into the sauce and topped it with the asparagus and sage. To finish, I covered my pot, lowered the heat to low, and allowed the meal to braise on the stovetop for 2 hours. 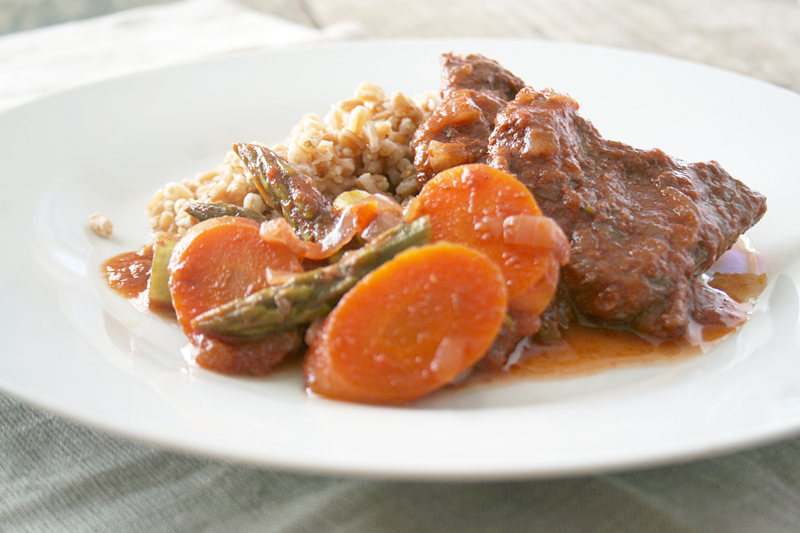 A braised spring stew with asparagus and carrots. In a large heavy bottomed pot or dutch oven, gently heat 3 tbls of olive oil. Brown the steak on both sides; 10-12 minutes. Once browned, remove from the pot and set aside. Add the onion and salt, and then saute for 3-4 minutes or until the onions just start to turn translucent. Add the carrots and saute for an additional 3 minutes. Add the wine to the vegetables and then, over medium high heat, simmer until the wine reduces; about 5-8 minutes. Once the wine has reduced, add the crushed tomatoes, mix through and simmer for an additional 10 minutes. To the pot, add the steak into the sauce. Top the steak with the asparagus and the sage. Cover, reduce the heat to low, and then cook for 2 hours or until the meat is fork tender and the vegetables have cooked through. I served the stew on top of a bed of farro. Also… stay tuned as I will be sharing all about a special giveaway Jovial is hosting where you can win a FREE trip to their culinary getaway in Italy! !